You may already know about Twin Cities Habitat for Humanity and how it provides affordable housing to local families. But you might be surprised how shopping and supporting ReStore home improvement outlets help divert over 2.2 million pounds of refuse from being thrown in landfills. You maybe know a bit about Twin Cities Habitat for Humanity's ReStore home improvement outlets. That they take donations of new and gently-used home improvement items, furniture, appliances, and more, sell them at a steep discount, and use the revenue to power Twin Cities Habitat's mission. Where do you go to find 20 colors of recycled paint at the attractive price of $16 per gallon? The Twin Cities Habitat for Humanity ReStore of course! But where did the ReStore team go to learn all about how to recycle paint? Just up the road from one of our own ReStore locations in Fridley Minnesota, home of Amazon Paint. With Earth Day approaching on April 22, you may be thinking of ways to live a more environmentally-friendly lifestyle. You might be considering things like carpooling to work, composting, supporting environmentally-friendly businesses, or donating your items instead of throwing them away. But what about that remodel project you've got planned? Did you know that most debris and leftover materials from a renovation will end up in landfills? There's also the issue of off-gassing from materials made with toxic chemicals. But there are ways to make your remodeling project more eco-friendly. Here are a few of our favorites. 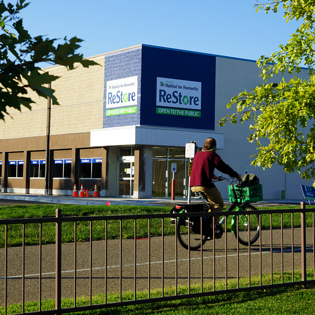 The ReStore team is proud to announce that we are officially a Bicycle Benefits participant! Last night, retailers from around the state of Minnesota gathered to recognize the 2017 Minnesota’s Retail Champions during the Retail Rally at the Opus College of Business at the University of St. Thomas. The Twin Cities Habitat for Humanity ReStore team was honored to be among the nominees attending the award ceremony. When you walk into Twin Cities Habitat for Humanity’s new ReStore in South Minneapolis, you’ll immediately see a great selection of furniture, lighting, paint, building materials, flooring and more. You’ll also see low prices on everything you need for your new home fix-up or repair projects. You’ll even see smiling faces of ReStore staff and volunteers eager to help you find exactly what you need. What’s not so easily noticed is what makes the new ReStore a great green partner to the community.